It contributes to a healthy, complete and balanced diet, helping to maintain low cholesterol levels. Recommended for sports, vegetarian and vegan nutrition. 350g PACK SIZE. High nutritional value: high in proteins, source of fibers, low in saturated fat and salt. It’s hand crafted in Emilia Romagna (Italy) using selected flours and low temperature slow drying process to preserve its nutritional properties. 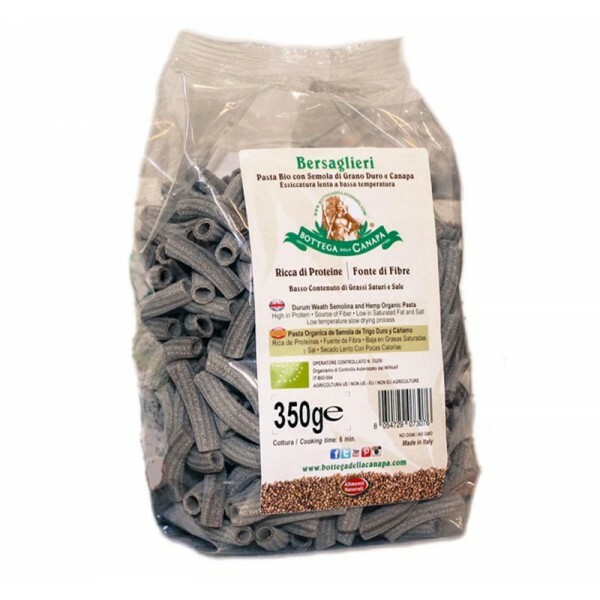 Thanks to the presence of organic hemp flour, this slightly nutty flavoured pasta is a functional food: it contributes to a healthy, complete and balanced diet, helping to maintain low cholesterol levels. Recommended for sports, vegetarian and vegan nutrition. Product Certified Organic by Suolo&Salute. Distributed by Bottega della Canapa. Disclaimer: The results are not guaranteed and may vary depending on the circumstances and from person to person. The information does not in any way replace the advice of a doctor or a nutrition expert. Organic durum wheat semolina, organic sativa hemp seeds flour 8%, water. (It may contains traces of soya and lupine). Analysis values of natural products can vary. It must be stored away from moisture. Keep in cold & dark place. Organic Certification: Suolo & Salute (certification body authorized by the Ministry of Agriculture, Food and Forestry Policies - Controlled Operator no. 33250) IT-BIO-004. Eu Agriculture. Add two tablespoons of olive oil into cooking salt water, observing the cooking time indicated on label. Drizzle with extra virgin olive oil or other basic seasonings to exalt the typical taste, e.g. artichoke and eggplant sauce, add a drizzle of hempseed oil and of Parmesan cheese shaving to taste.